Public issues for private repos. 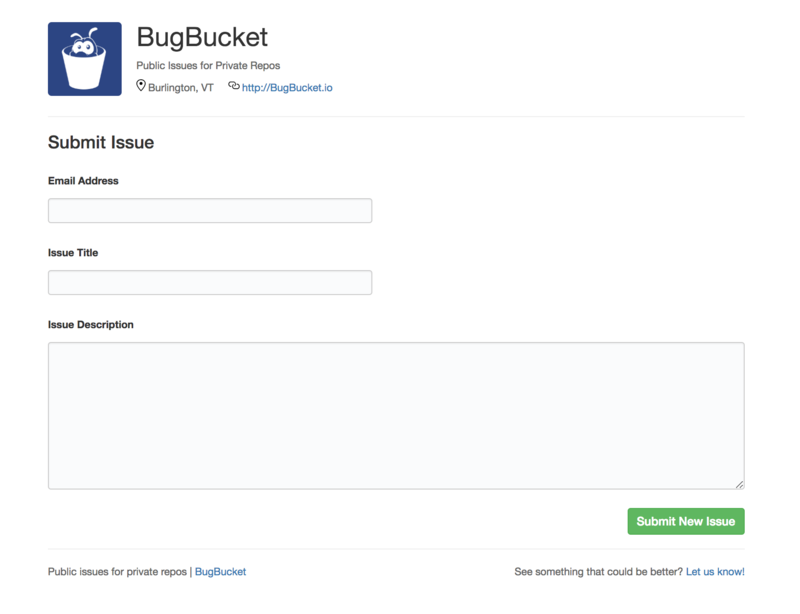 BugBucket creates a public interface to Github issues on a repository-by-repository basis. Whether you need a way for customers to submit feature requests or want to provide a place for API consumers to report bugs, BugBucket lets your users generate issues on the same platform that you'll resolve them on. BugBucket only needs permission to read and write to issues. We cannot access your code. BugBucket can be installed for individual repositories or for all repositories within an organization. Each repository gets its own BugBucket URL for submitting issues. BugBucket is currently in alpha and is free for alpha users. See something that could be better? | Let us know!